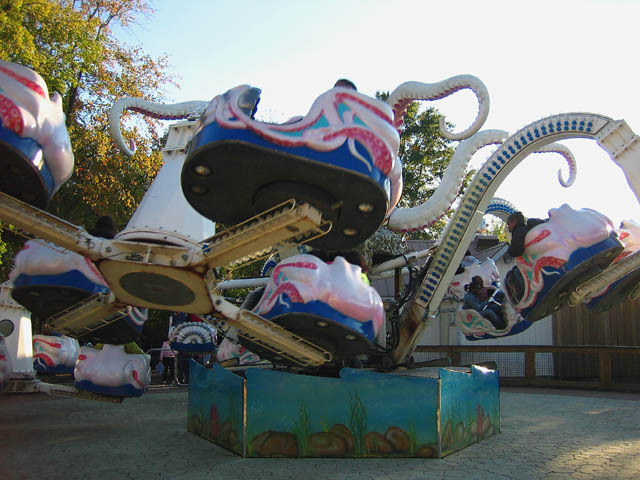 A fun scrambler type ride that rotates along several long arms, It takes you up in the air and tilts you back and forth and up and down. It also makes you dizzy which adds to the fun. Short duration and wait time. This is one of those reviews when I wish there were half points because this one sits between a 7 and an 8. I used to write this one off mostly because it looks so goofy and child-like. We got in line for this first on my last visit, but then left pissed because the ride op had the ride half full at best and didnt let us on. Later, when we had plenty of time we gave it a spin and really enjoyed the movements. I was very pleasantly surprised. It was so slow by that time at the park, that the op (a different and nicer one)let us just stay and ride it again. This was fun. Scrambler with a vertical axis added. Not as good as Rodeo at the same park, but similar. I love the falling backwards part of the spin cycle (although its just a split-second every now and then). Up & down & round & round. Ride ops gave a decent cycle length. This ride was great! The dizzines is half the fun! A nice enough scrambler-type ride, though it rotates along several axes, going up in the air and tilting back and forth. The movement is pretty fast. It definitely may make you dizzy.